Below are the paper submission rules of Etkileşim (Interaction) Üsküdar University Faculty of Communication Academic Journal. Page set up: 2,5 cm from top, bottom, both left and right. In text line spacing should be 1.5. In references, line spacing should be single. Page numbers should be placed at the bottom on the right. 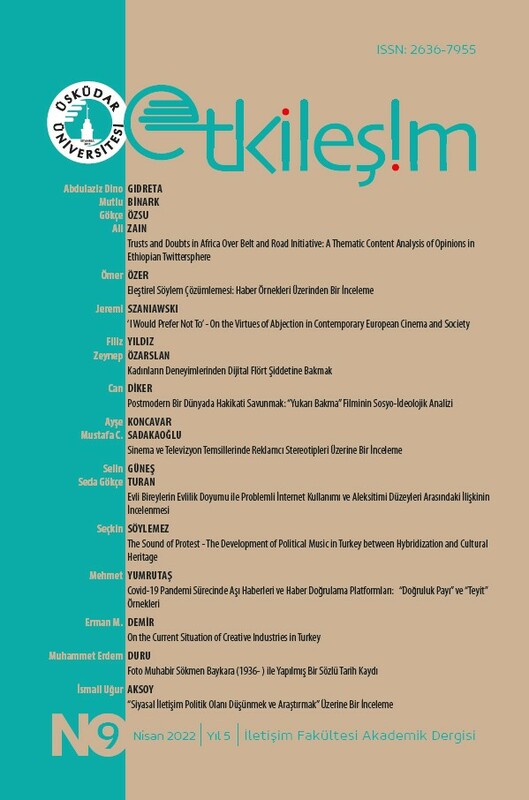 The main language of the journal is Turkish, contributions in English are also accepted. Revisions regarding to principles may be made by editors/co-editors. Revisions regarding language use, punctuation and abbreviations will be based on the most recent edition of the spelling guide of Turkish Language Institution. For Turkish written manuscripts, there should be an English abstract followed by the Turkish abstract before the introduction part. For English written manuscripts, there should be a Turkish abstract followed by English abstract before the introduction part. Maximum length of the manuscripts should be 30 pages including the abstracts and references. Abstracts, both in Turkish and English, should be no longer than 300 words including the main title in English and Turkish and five key words for both languages. Title of the article or a clear short version of the title should be indicated in the e-mail which is sent to the editor with article attached. The article title should be 14 point bold, centered and all in upper-case. The subtitles should be left-aligned, 12 point, bold and title case (with first letter of each word in upper-case). Name and surname of the author(s) should be placed under the main title, centered, and surname written in capitals. After surname, superscripted asterisk (*) should be placed and information regarding the author(s) must be written in Times New Roman 10 point and single line space that should be seen only in the first page of the article, justified in footer. Abstract heading should be title case, left-aligned, 12 point and bold. Abstracts and Key Words should be 11 point and 1.5 line spaced. Text should be justified, written in Times New Roman 12 points, 1,5 line spacing. New paragraphs should be 1,25” left indented. There should be a single space before the titles within the text. Expressions in the text, such as newspapers, books, magazines, artworks, computer games, mobile applications and brand names should be written in italic. Footnotes should be justified, written in Times New Roman 10 points, single line spacing. Text should start with a space after the footnote. References should be 11 point with single spacing. If the information is longer than a line, the next line(s) should start with 1,25 indent. In cases where more than one work of the same author is used, a straight line is used instead of the author's name in repetitions after the first work. In Üsküdar University Faculty of Communication Academic Journal Etkileşim (Interaction), the only referencing method that can be used is referencing within the main text method, that is to say APA. Therefore, references should be mentioned within the main text by indicating author’s surname, publication date and page number cited within parenthesis (Tarhan, 2006: 125). Extra explanations regarding the main text and other remarks should be given in footnotes. These notes should be numbered within the text as 1, 2, 3 and should be given at the end of the page with respective order and corresponding remarks. The footnotes for the remarks that are given at the end of the page should also be referred with referencing within the main text method, (APA). When quoting in the paper, if a direct quote is less than 40 words, incorporate it into your text and use quotation marks. If a direct quote is more than 40 words, make the quotation a free-standing indented block of text and do not use quotation marks. The quotation should be single spaced. If the author’s name is given in the main text, only the publication year and page number should be given within parenthesis. (2006: 25). If there are two co-authors, both authors’ surname should be mentioned: (Alemdar and Erdoğan, 2007: 19). If there are more than two co-authors, “et. al” should be included (Alemdar et al, 2004). If multiple references will be made for the same subject, resources should be separated by semicolon (Geray, 2005: 31; Moran, 2006: 37). Consecutive pages should be referenced as (Baudrillard, 2004: 20, 38 and 52). Non-consecutive pages should be referenced as (Bauman, 2012: 20-24, 48-56). If multiple publications with same author and same publication year will be referenced, these publications should be differentiated by adding a, b, c, etc to the publication year, (McQuail, 1987a: 55) (McQuail, 1987b: 40). If the author is unknown or not mentioned, first words of the study is used in parenthesis. It should be in italic and the date should be mentioned afterwards. It is essential to reach primary sources, however, if can not be reached due to some hardships, the source cited should be mentioned. E.g. (Güngör, 1997: 21 as cited in Storey, 2016: 297). In electronic sources with no author, source’s domain name and publication date should be specified (Radikal, 23 March 2016). The URL will be given only in the references. Archive documents such as State Archives of the Prime Ministry, Ottoman State Archives referred within the text should be specified as (BCA. 30.10 / 1.2.12) or (BOA. DH-SYS. 65/7). Referencing translated works, name of the author is essential, (Fiske, 1996: 25). Translator’s name is specified in the references. If cited from an edited book, author’s name of the article should be specified. Full identity of the edited book including the article should be presented in the references. Attachments (documents), shall be presented at the end of the text and down below should be a brief information as to the content of the document and proper citation in line with the relevant criteria. Other attachments (Table, Figure, Graphs) will be presented as Additional Table: 1, Additional Graph: 1 and Additional Figure 3 after the references. Figures, graphs and maps within the text should be titled right under and cited source should be given according to APA rules. The list of references should only include the resources, which were referred in the article. According to the APA rules, references should be sorted alphabetically by the surname of the first authors of the sources. If there exists more than one work of an author with the same date in the references, expressions “a, b, c” should be used to distinguish them from each other and this should be adhered to in the references in the text and in the references section. References should be listed in this order: Author’s surname and first letters of his name, publication date, name of the study (italic), place of publication. The units forming the information are separated from each other by full stop. There are two exceptions to this. Author’s surname and name with comma; publication date publisher’s name are separated with colon. All the works mentioned in references should be title case and in italic. Innis, H. (1950). Empire and Communication. Oxford: Clarendon Press. Horkheimer, M. and Adorno, T. W. (1972). Dialectic of Enlightenment. New York: Continuum. Leiss, W., Kline, S., Jhally, S. (1986). Social Communication Advertising. New York: Macmillan. Barthes, R. (1983). Mythologies. (A. Lavers, trans.). New York: Hill and Wang. Durham, M. and Kellner, D. (eds.) (2001). Media and Cultural Studies: Keyworks. Maiden, MA: Blackwell. Graham, A. (1996). “Are You Now or Have You Ever Been? Conspiracy Theory and The X-Files”. D. Lavery, A. Hague, M. Cartwright (eds.) Reading The X-Files. (52-62). Syracuse, NY: Syracuse University Press. Thomas, E. R. (2000). “Uses and Gratifications Theory in the 21st Century”. Mass Communication and Society. 3(1). 3-37. Tseëlon, E. (1998). Fashion, Fantasy and Horror. Arena. 12. 117. Laughland, O. (2018, May 7.) Fate of Iran Nuclear Deal at Stake as UK foreign secretary Heads to Washington. The Guardian. https://www.theguardian.com/world/2018/may/06/iran-nuclear-deal-donald-trump-boris-johnson. 07.05.2018. Parential Attitude Key to Healthier Drinking Habits. (2009, October 1). The Australian. 3. Montes, A. L. G. (2014). The Use and Perception of English in Brazilian Magazine Advertisements (Unpublished Ph.D. thesis). Arizona State University, USA. Strömbäck, J. and Luengo, Ó. G.. (2006). Framing and Election News Coverage in Spain and Sweden. In E. Yüksel (Ed. ),4th International Symposium Communication in the Millennium (75-86). Eskişehir, Turkey: Anadolu University. Haigh, M., Dardis, F. (2012). “The Impact of Apology on Organization – Public Relationships and Perceptions of Corporate Social Responsibility”. Public Relations Journal, 6(1). http://www.prsa.org/Intelligence/PRJournal/Documents/2012HaighDardis.pdf. 2 May 2015. Bordwell, D. (18 June 2013). David Koepp: Making the World Movie-Sized. http://www.davidbordwell.net/blog/page/27/. 11 January 2016. Sullivan, M. (2014, July 28). It’s Time to Push Back When Government Controls the Message. The New York Times. http://publiceditor.blogs.nytimes.com/2014/07/28/its-time- to-push-back-when-government-controls-the-message/. 2 April 2014. “The Top Films at the North American Box Office”. (13 October 2013). http://www.reuters.com/article/2013/10/13/boxoffice-chart-idUSL1N0I30A520131013. 15 April 2014. “Working Class”. (2014). Encyclopedia of Social Media and Politics. Washington: CQ Press. http://search.credoreference.com/content/entry/cqpresssomedpol/working_class. 17 December 2015. Friend, C. (n.d). “Social Contract Theory”. J. Fieser ve B. Dowden (der.) Internet Encyclopedia of Philosophy. http://www.iep.utm.edu/soc-cont/. 28 June 2014. “Post-Structuralism”. (n.d). Wikipedia. http://en.wikipedia.org/wiki/Post-structuralism. 14 July 2013. Bernstein, R., Rae, D., Loader, K. (Producers), Taylor-Wood, S. (Director). (2010). Nowhere Boy [Motion picture]. UK: Icon Film Ltd.
ChallengingMedia. (4 October 2006). Representation & the Media: Featuring Stuart Hall [Video]. https://www.youtube.com/watch?v=aTzMsPqssOY. 25 December 2006.